It’s been ‘the’ year for relocation to London, and the Royal Wedding in April has added a touch of romance and excitement to the monarchy. The Royal family is inextricably linked to the city of London and even if you weren’t living in London when Prince William married Katherine Middleton in April, you’ll have seen the images beamed around the world by the media. When you’re settled into your new flat and finished all the details of your relocation to London then you can start exploring the city and what better place to start than to visit the site of the Royal Wedding. You can do a number of tours that take in the Royal palaces, museums and parks, but you don’t have to dwell in history of the monarchy to enjoy your tour. The monarchy is a vibrant and up to date part of modern London and England. While there has been a certain amount of cynicism leveled at the royal family of late, it appears that the heir to the throne has been able to follow his heart and the path of true love when it came time for him to choose his bride. You have to understand what a decision it must have been for Prince William to marry his long time girlfriend, commoner, Katherine Middleton. The prince is going to be the King of England one day and he still married the girl of his dreams, and a commoner. You will not have to spend much time in the city after your relocation to London to realize that although it is invisible, there is a definite line still drawn between the class of the nobility and the rest of us. It IS a big deal that a future King of England has married someone of common birth; it certainly would not have been allowed twenty years ago. Yes. That recently. The story of William and Katherine is a modern fairy tale that says as much about the future of the monarchy in England as it does about the couple themselves. 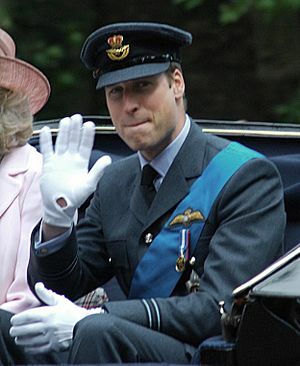 Prince William met his wife when they were both students at the University of St. Andrews in Scotland. They were both studying the same Art history course, although William moved to study geography. The couple lived n rented digs with a number of students. The couple stayed out of the media spotlight during their time at St. Andrews due to the fact that the Queen had asked all of the world’s press to stay away from the prince during his time as an undergraduate. It was in this space of privacy and away from the glare of the media eye that the couple fell in love. The couple graduated from the university in 2005 and not long after that the news of their relationship was splashed over the world after they were spotted skiing in Klosters, Switzerland. It must have been daunting for the young middle class Katherine who has no royal or noble family connections. Her parents run a successful mail order party décor company and Kate and her family lived in a modern home in Berkshire. The constant intrusion of the paparazzi is in some part responsible for their break up in 2007. Kate just needed a break and William needed to make the decision that would affect the rest of his life, and the future of his country. Although the couple reunited soon after, it was still a while before the world started to get the idea that Katherine would be joining the royal family. Kate slowly started being invited to official and private family events and function and in 2010 the couple announced their engagement to the world. While the world was fascinated by the pomp and circumstance of a royal wedding, they were also drawn to the event like never before because of the similarities and familiarity of their love story. The love story that was played out on the center stage of the magnificent city of London is in fact, our story as well.